NEW YORK (CNNMoney) -- Treasury Secretary Timothy Geithner defended his 2008 response to the Libor-fixing scandal that continues to unfold, and stressed that more reforms and enforcement actions are on the way. "We acted very early in response to concerns that the processes that set [the Libor] rate was impaired and flawed and vulnerable to misrepresentation," said Geithner, speaking at the CNBC Institutional Investor Delivering Alpha Conference in New York. Geithner said he took the "initiative to brief the entire U.S. regulatory community on this at a very early stage" and brought the concerns to the attention of British officials, along with detailed set of recommendations. "The United States, to its credit, set in motion at that stage a very, very powerful enforcement response, the first of which you've now seen," said Geithner. "And there's more to come." Late last month, Barclays inked a $450 million settlement with U.K. and U.S. regulators for regularly and knowingly misreporting rates. And more recently, documents were released that revealed a Barclays (BCS) official admitted to the New York Fed back in 2008 that the bank was under-reporting. Many other major banks, including Deutsche Bank (DB), Royal Bank of Scotland (RBS), Credit Suisse (CS), Citigroup (C, Fortune 500), UBS (UBS) and JPMorgan Chase (JPM, Fortune 500) have all said they're being investigated. 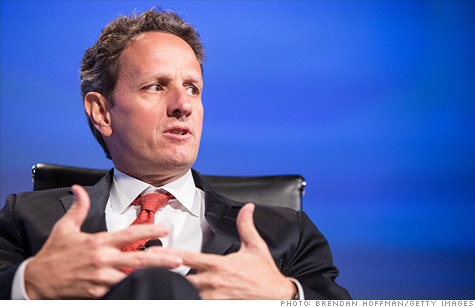 While the authorities have started to make modest reforms, Geithner said they do not go far enough. He said the United States is pushing for a broader effort with other countries that have a big stake in the Libor rate to ensure that future reforms address underlying issues. "You're going to see what I think ultimately will be very effective reform, led by a more global effort than what happened the first time," said Geithner, adding that it will be "critical to restoring trust and confidence in our financial system." Asked specifically about the Justice Department's criminal investigation into alleged manipulation of Libor, Geithner said that he can't comment on an enforcement case but reiterated that the United States acted early and very forcefully to address the concerns, and that there is "more to come." Geithner also addressed critics who have pointed to the length of time it took for the scandal to come to light, despite regulators' knowledge that banks were under-reporting interest rates. "We did what we felt was the most effective and most responsible response: we brought it to the British attention and pushed them to move on it," said Geithner. "And we brought it to the attention of the U.S. enforcement community, and as you saw, they acted on that. Now there was some time between that, but these cases take some time. A credible enforcement response means that when you bring charges, they are well supported." Geithner's comments come one day after Fed chair Ben Bernanke called the Libor system "structurally flawed" and suggested alternatives should be considered.